After last month's Tangerine, we have a stark contrast of a lush Taiwanese martial arts film 'Assassin' (2015) about a female assassin in 8th century China. This film won plaudits from critics, and won it's director Hou Haiao-hsien a best director award at Cannes. Selected by Taiwan as it's official entry for the Oscars for best foreign film, it was controversially overlooked and didn't make the shortlist, but despite this it topped 'Sight & Sound's poll of over 200 critics for best film of 2015. Come and judge for yourself. 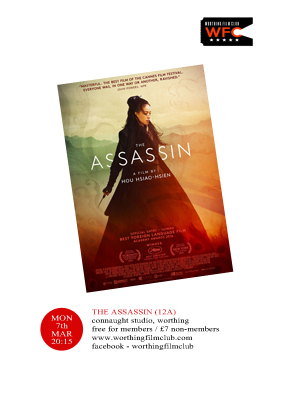 Screening 8.15pm at The Connaught Studio on Monday 7th March.